~~David Tubb is proud to release an innovative improvement in firing pin performance; the Chrome Silicon Duo firing pin spring. The CS Duo Firing Pin Spring set is composed of two coil springs wound in different directions. 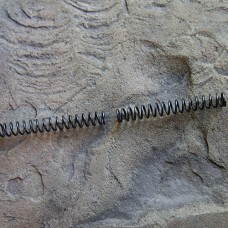 One spring is wound clockwise, the other is wound counter-clockwise and when arrayed as a set, these springs coordinate to eliminate the radial biasing imparted by a single spring that is coiled in only one direction, essentially removes the twisting motion associated with the firing pins fall to impact. When a single coil is compressed, it twists like a screw turns. When it’s compressed, it winds in the “opening” direction. This twisting action is unavoidable, but can be offset by providing a set of differently wound springs. Each spring still twists, but each in opposite directions cancelling each other’s biasing out. Because they are wound in different directions, the springs cannot intertwine. Both coil spring ends are flat-ground to ensure perfect consolidation when installed. David Tubb’s Chrome Silicon Duo Firing Pin Spring sets are still manufactured from the highest quality chrome silicon alloy and upheld to rigid 9002 Quality Control Standards yielding the highest quality, most consistent, and best performing spring available. All Tubb Precision CS springs are heat treated, stress relieved, and shot peened after winding to enhance grain structure, remove stresses, and maximize durability and stability; this guarantee’s extremely close tolerances in meeting our specification criteria. Conventional music wire springs cannot successfully be treated to these processes. As a result of our treatment process, our chrome silicon springs will lose less than 2% of their load over the first half-million compression cycles and no more than 7% over its life. A traditional spring can lose as much as 7% the first time it’s compressed. Due to the superior nature of its material, our CS springs have the same power as a conventional “extra power” spring, yet provide that extra striking energy using a lighter spring weight. This ensures reliable ignition while minimizing sear pressure and bolt lift effort, resulting in a more consistent, durable trigger pull and smoother rifle operation. Rigid 9002 Quality Control Standards, certified materials use, and our exclusive post-winding processing guarantees true performance. Although this is the last spring you’ll ever need to buy, it may not be the only Tubb Precision CS spring you ever purchase. 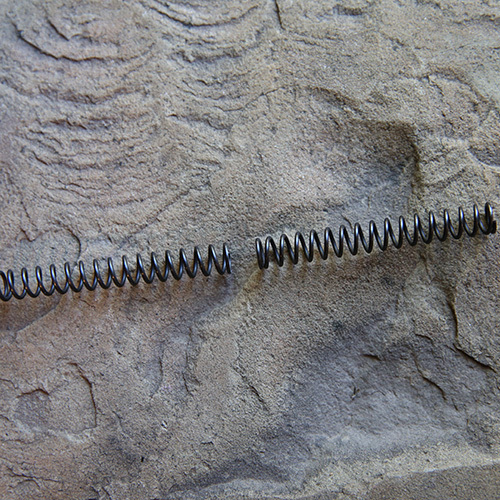 Conventional “extra-power” springs must use larger diameter wire. This reduces clearance between the firing pin and inside body wall of the bolt – friction is created, lock time is slowed, inconsistency develops. Our superior CS material means smaller diameter wire, more room inside the bolt body, less chance of binding and truer ignition consistency.